To Cite: Asadi M, Mohammadi M, Mohammadian B , Shahriari A, Foruozandeh H. The Protective Effect of Cichorium intybus L. Hydroalcoholic Extract Against Methotrexate-Induced Oxidative Stress in Rats, Jundishapur J Nat Pharm Prod. 2018 ; 13(4):e59556. doi: 10.5812/jjnpp.59556. Background: Methotrexate as a chemotherapy agent causes oxidative stress in the liver. Chicory (Cichorium intybus), a member of the Asteraceae family, is a well-known herb possessing various biological activities. Objectives: The present study was conducted to assess the protective effect of Cichorium intybus extract against methotrexate-induced oxidative stress in rats. Methods: Thirty male Wistar rats were divided into five groups. The negative control group was administered 5 mL/kg of normal saline. In the positive control group, normal saline was administered for 11 days, and a single dose of methotrexate (MTX; 20 mg/kg, i.p) was injected on the 7th day. Groups 3 - 5 received Cichorium intybus extract (CIE) at the doses of 100, 200, and 400 mg/kg p.o., respectively, for 11 days, and a single dose of MTX was administered on the 7th day. The animals were sacrificed 24 h after the last injection. Blood samples were withdrawn to measure serum aspartate aminotransferase (AST), alanine aminotransferase (ALT), alkaline phosphatase (ALP), and total bilirubin (TB) levels. Glutathione (GSH), malondialdehyde (MDA) levels and catalase (CAT), superoxide dismutase (SOD), and glutathione peroxidase (GPx) activities were assayed in liver tissues. A portion of the liver tissues was used for histological examination. Results: The results showed a dramatic reduction in the levels of AST, ALT, ALP, GSH, CAT, SOD, and GPx and a significant increase in the levels of TB and MDA by MTX administration. The groups pretreated with CIE showed a significant increase in the levels of AST, ALT, ALP, GSH, CAT, SOD, and GPx and a significant decrease in the levels of TB and MDA at all the doses, but the most significant change was observed at the dose of 400 mg/kg (P < 0.05). Our histological findings confirmed the above-mentioned results. Conclusions: The results revealed that Cichorium intybus has protective effects against the liver tissue damage induced by MTX. Copyright © 2018, Jundishapur Journal of Natural Pharmaceutical Products. This is an open-access article distributed under the terms of the Creative Commons Attribution-NonCommercial 4.0 International License (http://creativecommons.org/licenses/by-nc/4.0/) which permits copy and redistribute the material just in noncommercial usages, provided the original work is properly cited. Liver is a vital organ in the body that plays a pivotal role in the metabolism and detoxification of various compounds (1-5). It can be exposed to various chemicals, drugs, and many other xenobiotics such as MTX. MTX-induced hepatotoxicity mainly occurs as a result of the oxidative stress induced by MTX metabolites (6). MTX is a chemotherapeutic agent used in the treatment of certain types of cancers. Moreover, at lower doses, it is used to treat psoriasis and rheumatoid arthritis. Hepatotoxicity is the most serious side effect of MTX (7, 8). MTX inhibits dihydrofolate reductase (DHFR) and other folate-dependent enzymes such as 5-aminoimidazole-carboxamide-ribonucleotide-transformylase (AICAR) and thymidylate synthetase. Therefore, MTX inhibits DNA synthesis/repair and cellular replication (9). Cytosolic NAD (P)-dependent dehydrogenases are also inhibited by MTX. Malic enzyme and the pentose cycle are the main sources of nicotinamide adenine dinucleotide phosphate (NADPH) in proliferating cells. In addition, NADPH is used by glutathione reductase to maintain the reduced glutathione level, which is an important protective agent against reactive oxygen species (ROS) (9). Several studies reported that natural substances from plant sources exhibit strong antioxidant activities that could act against liver damage. Plants contain different antioxidant compounds including polyphenols and flavonoid compounds that exhibit protective effects against the oxidative stress and tissue damages caused by drugs and toxins (10). Cichorium intybus L. (Asteraceae family) is a worldwide grown plant known as chicory. In traditional medicine, this plant is used as a diuretic, anti-inflammatory, digestive, cardio tonic, and liver tonic agent (11) Recent studies on C. intybus have found some of its important constituents such as caffeic acid derivatives, phenyl acetic acid esters, flavonoids, coumarins, polyphenol, cichorioside, sonchuside A, ixerisosides, magnolialide, eudesmanolides, bitter sesquiterpenes, lactones, inulin, and vitamins (12). In the present study, we aimed to investigate the protective effect of the hydroalcoholic extract of Cichorium intybus against methotrexate-induced liver damage in rats. Bovine serum albumin (BSA), methotrexate (MTX), 2-thiobarbituric acid (TBA), 1,1,3,3-tetraethoxypropane (TEP), trichloro acetic acid (TCA), reduced glutathione (GSH), 5,5-Dithiobis (2-nitrobenzoic acid) (DTNB), and Bradford reagent were purchased from Sigma Aldrich Chemical Company (St. Louis, MO, USA). Male Wistar rats (weight: 200 - 250 g) were purchased from the Animal Centre of Shahid Chamran University, Ahvaz, Iran. The animals were kept in 12 h light/dark cycle under standard conditions with optimum temperature, humidity, ventilation, and free access to water and food. The plant species of interest were harvested from Shiraz, Iran. The collected plant tissues were then allowed to gradually dry out of sunlight. Then, they were ground and placed in 70% aqueous-ethanol solution. Then, the solution was shaken at regular intervals for three days. The solvent was passed through a Whatman filter paper, and then it was evaporated under vacuum in a rotary evaporator until being dried (13-17). The rats were randomly assigned to five equal groups including: (1) The control group that received normal saline, (2) MTX group that were given normal saline for 11 days followed by the administration of a single dose of MTX (20 mg/kg, i.p.) on the 7th day, (3 - 5) Cichorium intybus extract (CIE)-treated groups that were orally administered 100, 200 and 400 mg/kg of Cichorium intybus extract (CIE) (18, 19) followed by MTX (20 mg/kg, i.p.) on the 7th day (20, 21). The rats were anesthetized with ketamine/xylazine (70/7 mg/kg, i.p.) 24 h after the last treatment. Blood samples were drawn by cardiac puncture into clotting tubes while the rats were fasted. The rats’ liver was removed immediately and cleaned with ice-cold saline. Then, the blood samples were spun at 1050 × g at 24°C for 5 min to separate the serum and stored at 20°C. One section of the liver was fixed in 10% formalin solution for histological analysis. The remainder of the liver specimen was homogenized in an ice-cold phosphate buffer (pH 8) at a concentration of 10% (weight/volume) using a WiseTis HG-150 homogenizer and centrifuged (10000 x g) at 4°C for 1 h. Then, the clear supernatant, referred to as the liver homogenate, was kept frozen at 70°C for subsequent analyses. The total protein concentration in the homogenized-tissue supernatant was measured using crystalline BSA according the standards (22, 23). The activities of alkaline phosphatase (ALP), aspartate aminotransferase (AST), and alanine aminotransferase (ALT) were measured by using standard techniques and commercial kits. The Elman protocol was followed while measuring GSH level in the tissue homogenate based on the formation of a complex that turns yellow as GST reacts with Ellman’s reagent (DTNB) (24). Lipid peroxidation was determined by measuring the amount of total MDA via the TBA color reaction (25). In summary, a mixture containing 0.5 mL of tissue homogenate and 2.5 mL of TCA (10% w/v) was prepared and centrifuged at 3000 rpm for 10 min. Then, 2 mL of the supernatant was intermingled with 1 mL of the TBA solution (0.67% w/v). The reaction was then allowed to continue at 100ºC for 10 min until the formation of a pink color was observed. The reaction temperature was then lowered immediately and absorbance was read at 532 nm. We followed the procedure proposed by Kalantar et al. to evaluate CAT activity in the liver tissue (26). A mixture containing 200 µL of phosphate buffer and 50 µL of tissue supernatant was added to 250 µL of 0.066 M H2O2 and subjected to spectrophotometric investigation. A reduction in absorbance at 240 nm was observed and recorded for 60 s. The molar extinction coefficient of 43.6 M-1 cm-1 was used to determine catalase activity. SOD and GPx activity was measured by using Randox kit according to the kit protocol (Randox Labs, Crumlin, UK). Liver tissue was fixed in 10% phosphate buffered formalin and embedded in paraffin. A 5-µm section of the paraffin-embedded tissue was obtained and subjected to hematoxylin and eosin staining (H and E stain) for the upcoming microscopic observations. Data were analyzed by one-way analysis of variance (ANOVA) test followed by Tukey’s Post Hoc test. Results were expressed as mean ± SD. P value less than 0.05 was considered significant. Data analysis was performed using the Prism 5.0 (San Diego, CA, USA) statistical package program. Our findings showed a significant decline in AST, ALT, and ALP levels and a significant increase in TB level by MTX administration. CIE pre-treatment caused a significant elevation in the levels of AST, ALT, and ALP and a significant decrease in TB level. Moreover, the most significant change was observed at the dose of 400 mg/kg (P < 0.05; Figure 1). Figure 1. 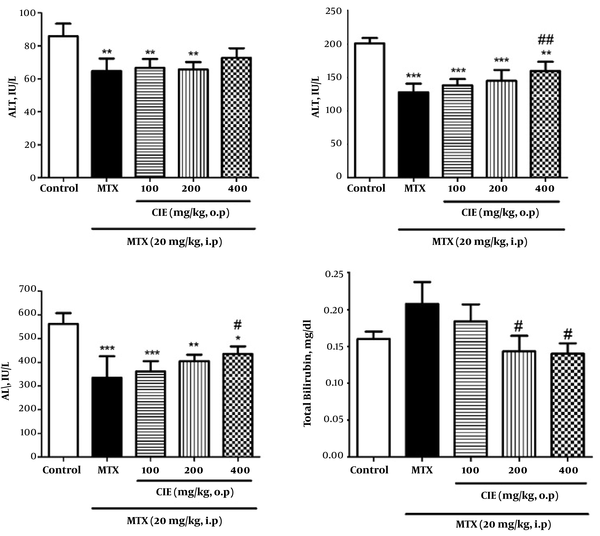 Effect of CIE on serum parameters in MTX-induced oxidative stress in rats. Values are means ± SD (n = 6). Data were analyzed by one-way ANOVA test followed by Tukey’s Post Hoc test. * Significantly different from the control group (* P < 0.05, ** P < 0.01, *** P < 0.001). # Significantly different from the MTX group (# P < 0.05, ## P < 0.01, ### P < 0.001). The results indicated that MTX remarkably increased the amount of MDA in rats (P < 0.05), and pretreatment with CIE (400 mg/kg) caused a significant decline in MDA level. GSH level significantly diminished in the MTX-treated group, and pretreatment with CIE (400 mg/kg) significantly inhibited MTX-induced GSH reduction (Figure 2). Also, MTX significantly lowered CAT, GPx, and SOD activity (P < 0.05), and pretreatment with 400 mg/kg of CIE significantly reserved the MTX-induced reduction of CAT, GPx, and SOD activity (Figure 3). Figure 2. Pretreatment Effect of CIE on MDA and GSH levels in liver tissues in MTX-induced oxidative stress in rats. Each value is representative of means ± SD (n = 6). Data were analyzed by one-way ANOVA test followed by Tukey’s Post Hoc test. * Significantly different from the control group (* P < 0.05, ** P < 0.01, *** P < 0.001). # Significantly different from the MTX group (# P < 0.05, ## P < 0.01, ### P < 0.001). Figure 3. Pretreatment Effect of CIE on the SOD, GPx and CAT activity in MTX- induced oxidative stress in rats. Each value is representative of means ± SD (n = 6). Data were analyzed by one-way ANOVA test followed by Tukey’s Post Hoc test. * Significantly different from the control group (* P < 0.05, ** P < 0.01, *** P < 0.001). # Significantly different from the MTX group (# P < 0.05, ## P < 0.01, ### P < 0.001). The histological pictures are shown in Figure 4. Liver histology in the control group showed normal hepatic architecture. In the MTX-treated group (Figure 4B), reduced cell swelling was observed in hepatocytes compared with the control group (Figure 4A). CIE treatment improved histological change in comparison with the MTX-treated group (Figure 4C - E). Figure 4. Histological pictures of liver in the experimental group (H and E). Magnification × 400. A, Control group, indicated normal pattern of rat liver histology; B, MTX-treated group, reduced cell swelling is seen in hepatocytes compared with the control group; C-E, MTX + CIE (100, 200,400 mg/kg )-treated group, treatment with CIE has improved histological change in comparison with MTX-treated group. Chemotherapeutic agents are well-known to generate acute toxic effects in numerous organ systems. For example, these agents cause damage to the bone marrow, mucosal membranes, gastrointestinal tract, and liver. One of the drugs whose consumption causes hepatotoxicity is MTX. This compound induces hepatotoxicity via the generation of ROS (27). According to the mechanism of action of MTX, free radicals attack lipids in liver cells, as a result of which a variety of aldehydes including MDA are produced causing lipid peroxidation and cell membrane damage (26). As a result of cell membrane damage, the enzymes in the cytosolic space including ALT and AST leak into the blood stream (28). The results of this study showed that the group administered MTX was associated with a significant increase in MDA level and a significant reduction in ALT, AST and ALP enzymes in comparison with the control group (Figure 1). The amount of increase in liver enzymes in the blood depends on the extent of damaged cells and the time interval between injury and blood sampling. After the injection of MTX, blood levels of these enzymes will increase due to liver cell damage. However, at the time of blood sampling, considering the reducing effect of MTX on the synthesis of DNA and proteins and half-life of ALT and AST enzymes, their serum levels will be diminished five days following injection. The significant enhancement in the level of bilirubin and histological changes indicates cellular tissue damage and destructive effects of MTX (9, 29). This finding is consistent with the results of Akbulut et al. on the cytoprotective effects of amifostine against MTX-induced hepatic injury (30). Moreover, our findings indicated a remarkable decrease in the activity of CAT, SOD, and GPx in the group administered MTX compared to the control group (Figure 3). Vardi et al. in 2010 studied the protective effect of ß-carotene against MTX-induced oxidative liver damage. In that study, the group given MTX showed a significant reduction in the activity of SOD and GPX enzymes (31). Cetin et al. in 2008 investigated the protective effects of grape seed extract on MTX-induced hepatic damage in rats. In that study, the group administered MTX compared with the control group showed a significant decline in SOD and GPX enzymes activity (32). According to the results of this study, chicory caused a significant increase in the activity of CAT, SOD, and GPx in the treatment groups compared to the group receiving MTX. It also reduced the amount of MDA and increased GSH level in the treatment groups compared to the group receiving MTX (Figures 2 and 3). Several studies have shown that many plants contain chemical and biological compounds that can affect physiological functions, and therefore, have therapeutic usage. According to those studies, the most important of these compounds are polyphenol compounds such as flavonoids. Hydroxyl polyphenols are very active; they neutralize free radicals by giving a them hydrogen atom or electron and exert their antioxidant effects through chelation of metals (33). One of the plants considered in traditional medicine is chicory, which contains abundant polyphenol compounds. Thus, it can have anti-oxidant properties (34). Several researchers have studied the effects of this plant on the level of hepatic enzymes and antioxidant factors. Li et al. investigated the protective effect of chicory against the liver fibrosis induced by CCl4. Their results showed that chicory could effectively protect the liver against CCl4 fibrosis (35). The results of the hepatic histopathological studies revealed that chicory’s leaf extract is capable of mitigating the damage caused by MTX, which can be observed quite clearly at the dose of 400 mg/kg (Figure 4). Since chicory has powerful antioxidant and anti-inflammatory effects, this plant can probably decrease the toxic effects of MTX on liver cells through exerting antioxidant effects and eliminating free radicals. Due to the hepatotoxicity of drugs and chemical agents, it is hoped that on the basis of the present study and other studies on different animal models as well as subsequent studies on human models this substance could be used as a safe drug. Ethical Considerations: The animals were maintained in 12 h light/dark cycle under standard conditions with optimum temperature, humidity, ventilation, and free access to water and food. Funding/Support: This work was a part of an M.Sc. thesis by Marzieh Asadi, which was supported by the Deputy of Research of Shahid Chamran University of Ahvaz, Ahvaz, Iran (grant number: 9547204). 1. Kalantari H, Foruozandeh H, Khodayar MJ, Siahpoosh A, Saki N, Kheradmand P. Antioxidant and hepatoprotective effects of Capparis spinosa L. fractions and Quercetin on tert-butyl hydroperoxide-induced acute liver damage in mice. J Tradit Complement Med. 2018;8(1):120-7. doi: 10.1016/j.jtcme.2017.04.010. [PubMed: 29321999]. [PubMed Central: PMC5755993]. 2. Goudarzi M, Kalantar M, Kalantar H. The hepatoprotective effect of gallic acid on mercuric chloride-induced liver damage in rats. Jundishapur J Nat Pharm Prod. 2017;12(4). doi: 10.5812/jjnpp.12345. 3. Kalantari H, Houshmand G, Hasanvand A, Kalantar M, Goudarzi M, Khadem Haghighian H. Ameliorative effects of red lentil extract on sodium arsenite-induced oxidative stress in rats. Jundishapur J Nat Pharm Prod. 2017;(In Pre). doi: 10.5812/jjnpp.64309. 4. Mehrzadi S, Fatemi I, Malayeri AR, Khodadadi A, Mohammadi F, Mansouri E, et al. 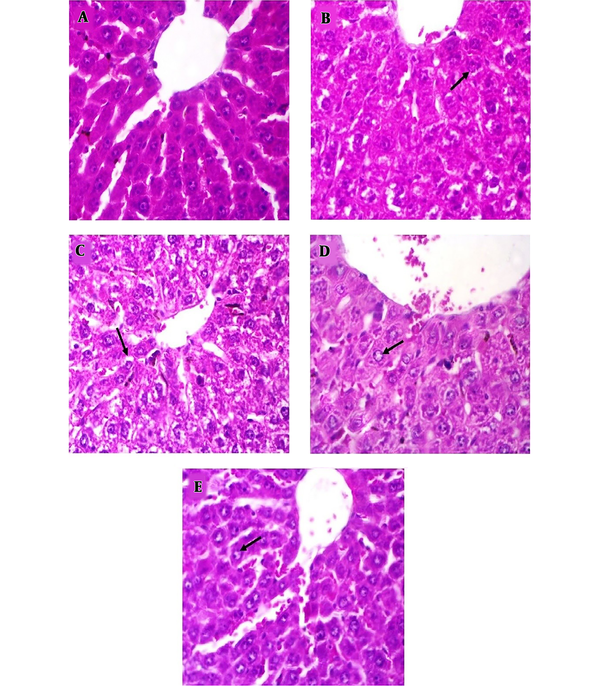 Ellagic acid mitigates sodium arsenite-induced renal and hepatic toxicity in male Wistar rats. Pharmacol Rep. 2018;70(4):712-9. doi: 10.1016/j.pharep.2018.02.007. [PubMed: 29935397]. 5. Moosavi M, Rezaei M, Kalantari H, Behfar A, Varnaseri G. l-carnitine protects rat hepatocytes from oxidative stress induced by T-2 toxin. Drug Chem Toxicol. 2016;39(4):445-50. doi: 10.3109/01480545.2016.1141423. [PubMed: 26888052]. 6. Bleibel W, Kim S, D'Silva K, Lemmer ER. Drug-induced liver injury: Review article. Dig Dis Sci. 2007;52(10):2463-71. doi: 10.1007/s10620-006-9472-y. [PubMed: 17805971]. 7. Brown PM, Pratt AG, Isaacs JD. Mechanism of action of methotrexate in rheumatoid arthritis, and the search for biomarkers. Nat Rev Rheumatol. 2016;12(12):731-42. doi: 10.1038/nrrheum.2016.175. [PubMed: 27784891]. 8. Mehrzadi S, Mehrabani M, Malayeri AR, Bakhshayesh M, Kalantari H, Goudarzi M. Ellagic acid as a potential antioxidant, alleviates methotrexate-induced hepatotoxicity in male rats. Acta Chir Belg. 2018:1-9. doi: 10.1080/00015458.2018.1455419. [PubMed: 29587597]. 9. Chan EL, Cronstein BN. Mechanisms of action of methotrexate. Bull Hosp Jt Dis. 2013;71(suppl 1):S5-8. 10. Zhang H, Tsao R. Dietary polyphenols, oxidative stress and antioxidant and anti-inflammatory effects. Curr Opin Food Sci. 2016;8:33-42. doi: 10.1016/j.cofs.2016.02.002. 11. Satmbekova D, Srivedavyasasri R, Orazbekov Y, Omarova R, Datkhayev U, Ross SA. Chemical and biological studies on Cichorium intybus L. Nat Prod Res. 2018;32(11):1343-7. doi: 10.1080/14786419.2017.1343319. [PubMed: 28629227]. [PubMed Central: PMC5736470]. 12. El-Lakany AM, Aboul-Ela MA, Abdul-Ghani MM, Mekky H. Chemical constituents and biological activities of Cichorium intybus L. Natural Prod Sci. 2004;10(2):69-73. 13. Javadi I, Rashidi Nooshabadi M, Goudarzi M, Roudbari R. Protective effects of celery (Apium graveloens) seed extract on bleomycin-induced pulmonary fibrosis in rats. J Babol Univ Med Sci. 2015;17(1):70-6. doi: 10.22088/jbums.17.1.70. 14. Kalantar M, Houshmand G, Kalantar H, Asadi M, Goudarzi M. Protective effect of hydroalcoholic extract of Lavandula officinalis L. on gentamicin induced nephrotoxicity in rats. J Babol Univ Med Sci. 2016;18(7):62-7. doi: 10.22088/jbums.18.7.62. 15. Kalantar M, Goudarzi M, Khodayar MJ, Babaei J, Foruozandeh H, Bakhtiari N, et al. Protective effects of the hydroalcoholic extract of Capparis spinosa L. against cyclophosphamide-induced nephrotoxicity in mice. Jundishapur J Nat Pharm Prod. 2016;11(4). doi: 10.17795/jjnpp-37240. 16. Goudarzi M, Esmaeilizadeh M, Dolatshahi M, Kalantar H, Frouzandeh H, Kalantar M. Protective effect of elaeagnus angustifolia L. Fruit hydroalcoholic extract on cyclophosphamide-induced nephrotoxicity in mice. Shiraz E Med J. 2018;19(1). 17. Salimi A, Motaharitabar E, Goudarzi M, Rezaie A, Kalantari H. Toxicity evaluation of microemulsion (nano size) of sour cherry kernel extract for the oral bioavailability enhancement. Jundishapur J Nat Pharm Prod. 2014;9(1):16-23. [PubMed: 24644434]. [PubMed Central: PMC3957138]. 18. Heibatollah S, Reza NM, Izadpanah G, Sohailla S. Hepatoprotective effect of Cichorium intybus on CCl4-induced liver damage in rats. African j Biochem res. 2008;2(6):141-4. 19. Jamshidzadeh A, Khoshnood MJ, Dehghani Z, Niknahad H. Hepatoprotective activity of Cichorium intybus L. leaves extract against carbon tetrachloride induced toxicity. Iranian J Pharm Res. 2006;5(1):41-6. 20. Mehrzadi S, Fatemi I, Esmaeilizadeh M, Ghaznavi H, Kalantar H, Goudarzi M. Hepatoprotective effect of berberine against methotrexate induced liver toxicity in rats. Biomed Pharmacother. 2018;97:233-9. doi: 10.1016/j.biopha.2017.10.113. [PubMed: 29091871]. 21. Safaei F, Mehrzadi S, Khadem Haghighian H, Hosseinzadeh A, Nesari A, Dolatshahi M, et al. Protective effects of gallic acid against methotrexate-induced toxicity in rats. Acta Chir Belg. 2018;118(3):152-60. doi: 10.1080/00015458.2017.1394672. [PubMed: 29069994]. 22. Bahrami N, Mehrzadi S, Goudarzi M, Mansouri E, Fatemi I. Lycopene abrogates di-(2-ethylhexyl) phthalate induced testicular injury by modulating oxidative, endocrine and inflammatory changes in mice. Life Sci. 2018;207:265-71. doi: 10.1016/j.lfs.2018.06.009. [PubMed: 29886059]. 23. Mehrzadi S, Bahrami N, Mehrabani M, Motevalian M, Mansouri E, Goudarzi M. Ellagic acid: A promising protective remedy against testicular toxicity induced by arsenic. Biomed Pharmacother. 2018;103:1464-72. doi: 10.1016/j.biopha.2018.04.194. 24. Ellman GL. Tissue sulfhydryl groups. Arch Biochem Biophys. 1959;82(1):70-7. doi: 10.1016/0003-9861(59)90090-6. 25. Kalantar H, Sabetkasaei M, Shahriari A, Haj Molla Hoseini M, Mansouri S, Kalantar M, et al. The effect of rapamycin on oxidative stress in MCF-7 and MDA MB-231 human breast cancer cell lines. Jundishapur J Nat Pharm Prod. 2016;11(3). doi: 10.17795/jjnpp-38177. 26. Kalantar M, Shirali S, Hasanvand A, Valizadeh M, Tavakoli R, Asadi M, et al. Ameliorative effects of hydroalcoholic extract of lavandula officinalis L. on methotrexate-induced oxidative stress in rats. Pharm Sci. 2017;23(1):18-26. doi: 10.15171/PS.2017.04. 27. Fotoohi AK, Albertioni F. Mechanisms of antifolate resistance and methotrexate efficacy in leukemia cells. Leuk Lymphoma. 2008;49(3):410-26. doi: 10.1080/10428190701824569. [PubMed: 18297517]. 28. Del Rio D, Stewart AJ, Pellegrini N. A review of recent studies on malondialdehyde as toxic molecule and biological marker of oxidative stress. Nutr Metab Cardiovasc Dis. 2005;15(4):316-28. doi: 10.1016/j.numecd.2005.05.003. [PubMed: 16054557]. 29. Kim WR, Flamm SL, Di Bisceglie AM, Bodenheimer HC. Serum activity of alanine aminotransferase (ALT) as an indicator of health and disease. Hepatol. 2008;47(4):1363-70. doi: 10.1002/hep.22109. [PubMed: 18366115]. 30. Akbulut S, Elbe H, Eris C, Dogan Z, Toprak G, Otan E, et al. Cytoprotective effects of amifostine, ascorbic acid and N-acetylcysteine against methotrexate-induced hepatotoxicity in rats. World J Gastroenterol. 2014;20(29):10158-65. doi: 10.3748/wjg.v20.i29.10158. [PubMed: 25110444]. [PubMed Central: PMC4123346]. 31. Vardi N, Parlakpinar H, Cetin A, Erdogan A, Cetin Ozturk I. Protective effect of beta-carotene on methotrexate-induced oxidative liver damage. Toxicol Pathol. 2010;38(4):592-7. doi: 10.1177/0192623310367806. [PubMed: 20448084]. 32. Cetin A, Kaynar L, Kocyigit I, Hacioglu SK, Saraymen R, Ozturk A, et al. Role of grape seed extract on methotrexate induced oxidative stress in rat liver. Am J Chin Med. 2008;36(5):861-72. doi: 10.1142/S0192415X08006302. [PubMed: 19051353]. 33. Pandey KB, Rizvi SI. Plant polyphenols as dietary antioxidants in human health and disease. Oxid Med Cell Longev. 2009;2(5):270-8. doi: 10.4161/oxim.2.5.9498. [PubMed: 20716914]. [PubMed Central: PMC2835915]. 34. Street RA, Sidana J, Prinsloo G. Cichorium intybus: Traditional Uses, Phytochemistry, Pharmacology, and Toxicology. Evid Based Complement Alternat Med. 2013;2013:579319. doi: 10.1155/2013/579319. [PubMed: 24379887]. [PubMed Central: PMC3860133]. 35. Li GY, Gao HY, Huang J, Lu J, Gu JK, Wang JH. Hepatoprotective effect of Cichorium intybus L., a traditional Uighur medicine, against carbon tetrachloride-induced hepatic fibrosis in rats. World J Gastroenterol. 2014;20(16):4753-60. doi: 10.3748/wjg.v20.i16.4753. [PubMed: 24782629]. [PubMed Central: PMC4000513].